Includes all meals, drinks, guides & dogs, ammo, bird cleaning & packing, transportation from select local airports (Bemidji, Brainerd, Duluth), daily housekeeping, hot field lunch, kennel if needed. PGC only charges for hunting days only. Guest provides non-resident hunting license. Gratuities are not included for guides and PGC staff. Your hunting dog is welcome. Only with current vaccinations. Due to limited availability, at this time Pineridge Grouse Camp only offers the all-inclusive hunting program for the 2019 hunting season. Please call in August to check if we have any daily available hunt. 50% non-refundable deposit is due to confirm all 2019 dates. Please call or e-mail for available dates. 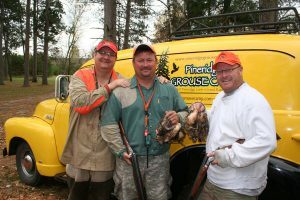 (jerry@pineridgegrousecamp.com) The Minnesota grouse season opener is September 15, 2019 and takes a break the first two weeks of November due to the rifle deer hunting season. Season ends on December 31, 2018. We require a 50% non-refundable deposit once we confirm your date. If an emergency develops that you need to change your dates, we will try and accommodate your request but can’t guarantee a change due to other hunters and commitments by Pineridge Grouse Camp. The deposit is non-refundable. Once your dates are confirmed you will be mailed/e-mailed an information packet on what you need to bring, travel plans, dietary needs, where to get your non-resident hunting license and other information regarding your stay at the camp. We welcome your dogs! Please let us know if you will be bringing your hunting companion so we can make the necessary arrangements with our guides. If you do bring your hunting dog, they need to be fully vaccinated and documentation must be provided to state as such. Pineridge Grouse Camp is not responsible for any injuries your dog may incur during the hunt or your stay at the camp. If you need Acrobat Reader click here.